Two servicemen of the Ukrainian Armed Forces suffered injuries in the anti-terrorist operation zone (ATO) in Donbas over the past day, Ukrainian Presidential Administration spokesman for military matters Andriy Lysenko has said. "There are no fatalities amongst Ukrainian servicemen, yet two soldiers are injured," Lysenko said at a press briefing in Kyiv on Saturday. The Ukrainian presidential administration's representative said that it was the matter of non-battle casualties. 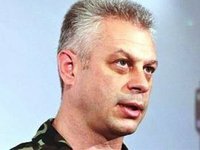 In addition, Lysenko confirmed the death of a serviceman of the Ukrainian Aidar battalion on January 1. "He did not die in combat," he said. An inquiry into the death of the Aidar battalion serviceman is being conducted, he said. A report about the death of the battalion serviceman near Horlivka on January 1 was published on the Aidar's page on Facebook.